I’ve been getting many requests for tips on Paris, from where to stay, what arrondissements are best, where to shop, what to see, and more! So it only makes sense to start a SJL Travel guide segment specifically for Paris. It’s been a long overdue series! Having spent a decent amount of time in the city, this will be a series based on all that I’ve learned and my personal experiences. I may not know everything about this special city, but what I do know will be very helpful to get the groundwork done so you know what to expect when visiting Paris! 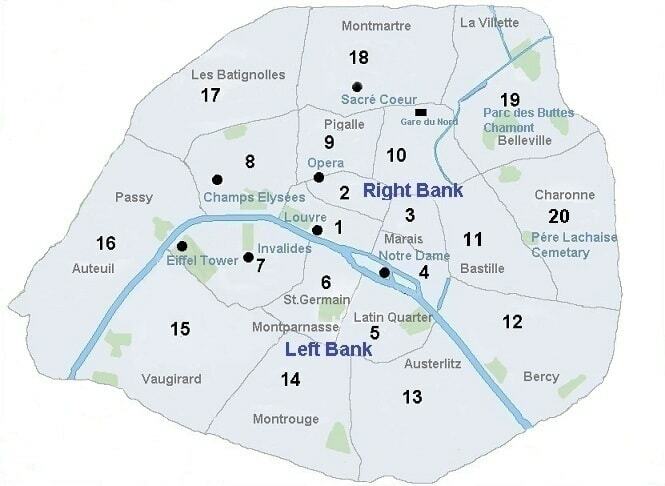 I’ve stayed in a few different areas of Paris, and the city is huge, so you will have TONS of options. But it all depends on what kind of Paris YOU want to experience. The best way to get to know your way around Paris is by walking, so choosing a location close the the places you definitely want to see is important. If you brave the metro, that’s another thing to keep in mind, and look for places close to metro entrances. Overall, if you memorize what is where based on the river, and in which arrondissements, you’ll have a good feel for the lay of the land. While this exact listing is no longer available, we stayed with Perfectly Paris, in their Artist’s Corner flat around the corner from the Moulin Rouge. It was a quaint, and simply chic flat that’s very typical of Parisian flats. You’ll find it was the backdrop for a bit of my Paris content! Our Pomeranian also LOVED being there. The sound-proofing windows blocked out all the street noise. 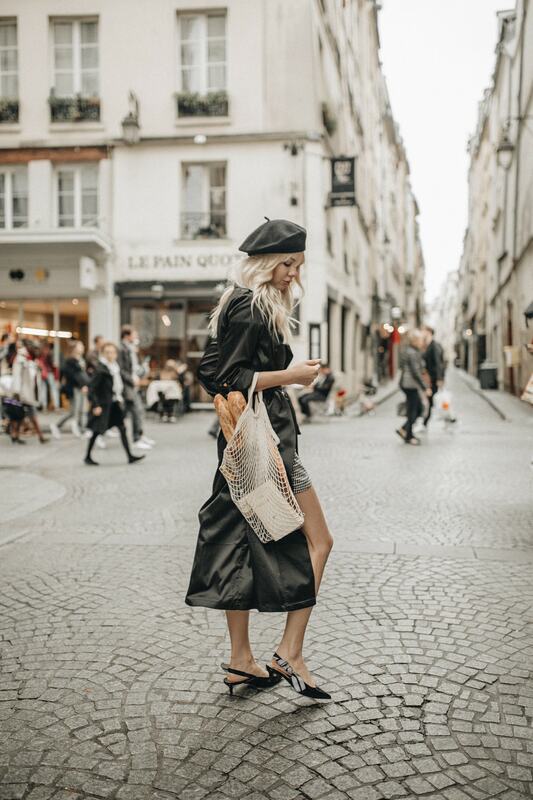 Marais is one of the go-to spots for influencers to visit because it’s clean, beautiful, close to most the sites, and central to Paris. When we stayed there early fall, it was magical! Our flat was Le Passage du Marais of Cobblestone Paris Rentals. I highly recommend any of their rentals, as they have such high standards for their flats that you are guaranteed the perfect experience! Their places are extremely clean, all new remodels or up to hotel standard, and sooooo quaint! This is something that’s hard to find in regular airBnB’s, and something you might want to look into if you don’t want to do hotels, and prefer a more homey stay. Marais has plenty of shopping close by, like Les Halles mall which also has it’s own metro entrance. The restaurants and cafe’s (which get many questions when appearing in my photos) are the Parisian standard! It’s close to Notre Dame and Shakespeare & Co. Le Grand Nerf cafe was right around the corner from where we stayed, and has great Es Cargot and people watching. So the exact spot we stayed was right on the border of the 2nd and 10th Arr., so it wasn’t as far away as the 10th Arr. sounds. We were practically in the 2nd, and just a few blocks away from the Bonne Nouvelle Metro Entrance. Though currently not available, we chose this Charming French Studio on Rue d’Hautville to use as a photo studio as it was decently big, had 4 huge windows with balconies, and plenty of natural light. Its furnishing was minimal at the time as we were the first people to stay there, but worth it for the use of a photo studio! It is quite noisy as it’s right on the corner above a bar/restaurant, so you wake up with the morning traffic around 10 am, and go to bed late with the Parisians out and about in the streets. This spot is still close enough to hop in an Uber or on the metro and quickly get to our favorite Paris spots! There’s an AMAZING Boulangerie on the corner just steps away, a few blocks away from the Amour Hotel and Le Grand Rex Cinema Theater. And it’s directly north of Théâtre du Châtelet, and Pont Neuf, which is still very central of the city. Though some people don’t appreciate the area of Bonne Nouvelle, I think it’s rather underrated and it’s sort of up-and-coming! It is more of a business district, so the boulangeries, cafes, and restaurants are usually closed on Sundays and aren’t open too late at night. We stayed in the most cozy Hôtel Bonne Nouvelle on a quiet street with a perfect scene of the rooftops and Eiffel Tower off in the distance! Just a 10 minute walk from Rue de Petits Carreaux, one of the most quaint areas we stumbled on, which also had cafes/boulangeries/restaurants open on a Sunday. L’Appartement Sézane is about a 10-15 minute walk away. It’s still directly north of Les Halles and Pont Neuf, and central of the city. What was great to me, was how close it was to Palais Royal, one of my absolute must-visit places whenever in Paris! A 6 minute drive and 15 minute walk. There’s you’ll find Café Kitsuné and other shops, among one of the most cozy gardens to spend a sunny afternoon. 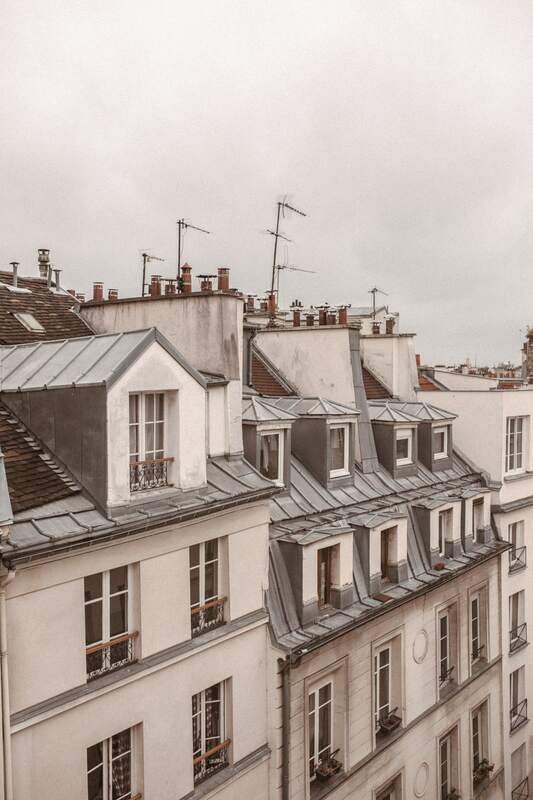 Because Paris is overwhelming to first timers, I highly recommend putting together a partial plan for the places you want to see before picking where you stay. Like I mentioned earlier, it can take time to catch a ride during traffic, so you’ll not want to waste any precious time. Maybe your Hit List, and try to book your stay somewhere close to those. Central of the city is your best bet. But here are some of the top areas I recommend! If you want my general favorite Arr. to stay in, that would be the 1st because it is the most central and closest to my personal favorite sites. 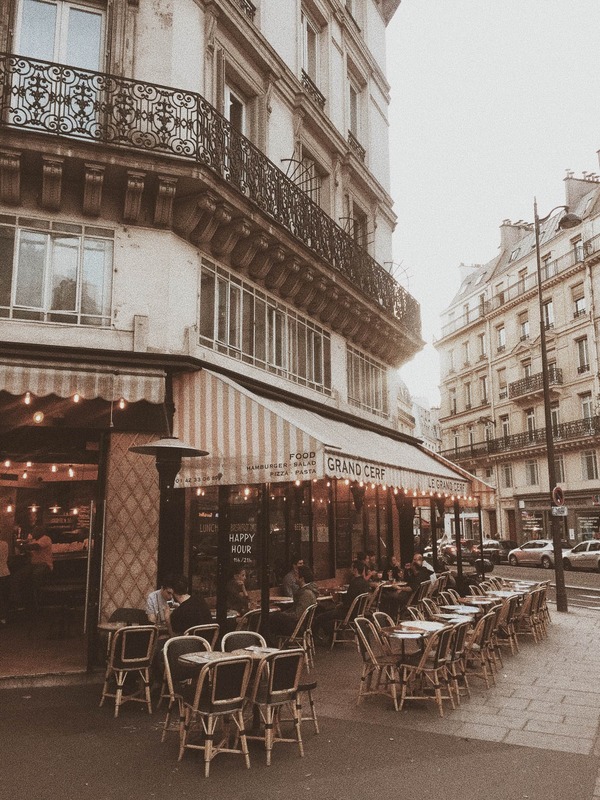 As previously mentioned, Marais is one of the nicer areas most bloggers stay when in Paris. It’s clean, beautiful, photogenic, and central to shopping and the sites. 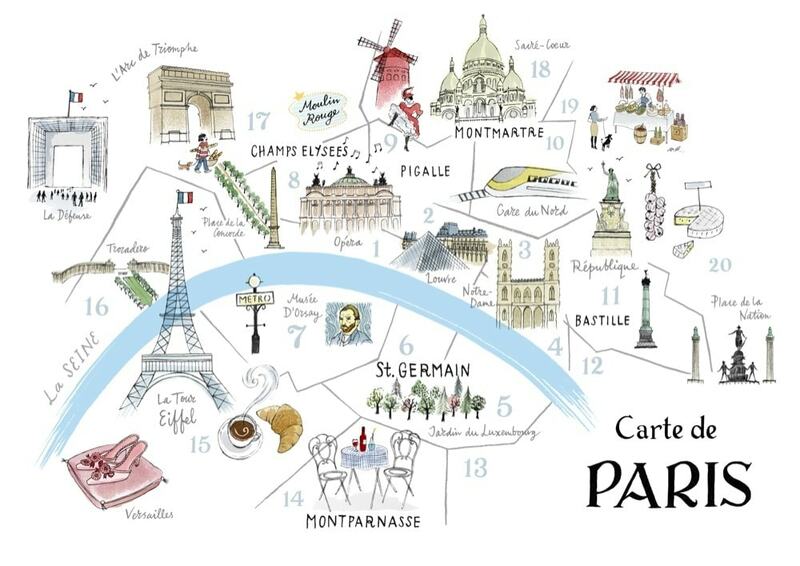 Closest to: Notre Dame, Post Neuf, Jardin des Plantes, Shakespeare & Co, Place Dauphine, Carousel & Hotel de Ville. If you want to be where it’s all happening, Saint-Germain is that place! All the iconic shops and cafes are on this street. And a lot of the tourist sites are nearby. I think it’s one of the most fun areas to experience all Paris has to offer! The historic street that leads you from the Arc du Triomphe to Place de la Concorde, it has all the big end shopping and is iconic to the Paris story. The neighborhood literally next door to the Eiffel Tower, you’ll always have the site of the tower in your peripheral vision. It’s one of the cleanest areas I walked around in Paris, and very chill vibes in Gros-Caillou with beautiful nouveau architecture details.